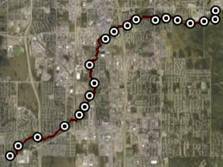 Creeks in Anchorage are home to wild salmon and other life that depend on clean water to survive. Read on to learn how you can help keep our creeks clean and salmon-friendly. Healthy salmon depend on good water quality. Keep trash, oil and other pollutants out of our creeks. Properly dispose of household chemicals and other toxic waste at the Anchorage Regional Landfill Hazardous Waste Collection Center. Respect creek banks. Avoid trampling, cutting, or mowing vegetation along the banks. Scoop the Poop! Pet waste pollutes our creek water. Please pick up after your pet and properly dispose of pet waste. Keep a buffer of native trees and vegetation along streambanks. Buffers protect property from erosion and provide salmon habitat. Do not introduce Northern Pike into our waters. These predators devastate salmon populations and ruin excellent local salmon fishing. Plant only native flowers, shrubs and trees. Non-native plants such as purple loosestrife can destroy salmon habitat. Direct rainwater from your gutter downspouts through a rain garden. Rain gardens filter stormwater and help keep our creek water clean. Volunteer! Participate in city-wide creek cleanup events and other beautification programs. 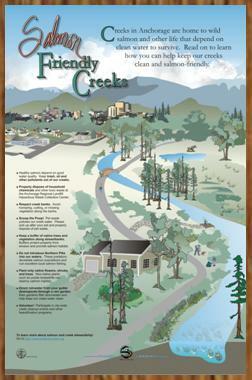 To learn more about salmon and creek stewardship, go to salmoninthecity.muni.org.